Bali is one island in Indonesia that is in love by the tourists to visit and vacation. it is because the island of Bali is famous for many temples, so that Bali is called the “island of gods”. Not only famous for its many temples in Bali are also many places where tourism is very beautiful, and for those who had visited Bali must already know that. highlight the one in Bali is very beautiful beaches such as Kuta beach, Sanur beach, beach seminyak and others. people who have been to Bali if they want to go home, of course, would bring souvenirs or memories of bali typical souvenirs such as paintings, sculptures, clothes bali, bali and other arts. for those of you lovers of Bali is certainly often to places to find souvenirs of art, but now for those of you who frequently came to Bali especially live sanur area, do not be confused by a typical search by-bali. 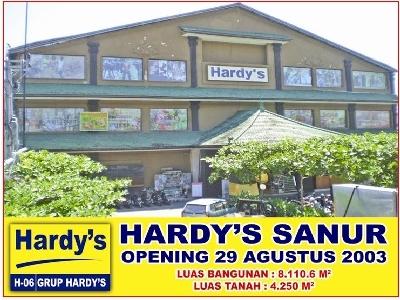 Hardy’s Sanur our shopping and recreation center provides you need like painting bali, bali art, bali clothing, and others. So what are you waiting. immediately come to Hardy ‘Sanur.